The major phases of this lunar journey are noted above, and you may want to note these in your Moon Chart or journal. And coming soon is the Autumn Equinox in the Northern Hemisphere and the Spring Equinox in the Southern Hemisphere. The Equinox arrives on September 22nd at 1:02 PM Pacific Time / 20:02 UTC. For those in the Southern Hemisphere, this Equinox marks the astronomical start of Spring and is known by many in the Pagan or Wiccan Communities as Ostara, Alban Eilir (Light of the Earth) in Druid communities, and as Cónacht an Earraigh in Irish Gaelic. Such a glorious week and such a glorious colourful time of the year (sorry, my Northern Hemisphere entrainment is showing!) as we approach astrological Autumn. . . a New Moon on September 19th/20th, followed by the Autumn (Spring in the SH) Equinox on Friday, September 22nd. 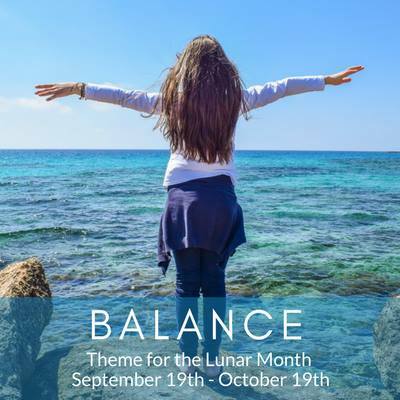 The Equinox has inspired my theme for this lunar month: Balance. If this theme works for you, wonderful! If not, choose another theme that resonates… perhaps inspired by your Dark Moon reflections on last month’s journey. In what is a hectic world for many, Mama Earth and Grandmother Moon give us many “prompts” throughout the year to reflect on our own balances… work/play, self/others, spiritual/ secular, etc. Twice a month, La Luna moves into the Quarter position, when She is half-light, half-dark… a potent example of the fleeting Yin-Yang balance. And twice a year, we experience the Equinox when Mama Earth herself is in balance with Father Sun… the days and nights are equal length, and we change seasons astronomically, from Winter to Spring and from Summer to Autumn. So many influences at this time! The New/Dark Moon brings us the deep feminine energy of the Crone, the wisdom-keeper, the blood-mystery of menopause, the wise blood within. The Crone can be represented by goddesses such as Hecate or An Cailleach. ​The Fall Equinox brings us the energy of Mab, Demeter, Hera, and the Spring Equinox brings us the energies of Persephone and Artemis. drawing cards for the New Moon Medicine Wheel layout, or any layout your prefer. And this Dark Moon/New Moon also is the time to complete the PREVIOUS month’s journey . . . your own Moon Lodge of reflection on the journey, and noting the wisdom gained. Do YOU have any New Moon practices you would like to share? or the Bean Gealach Circle (open to all) page on Facebook to share. ​For this month's theme of Balance, consider these Soul Questions as you journey, meditate, or pull cards for your layout. If these not resonate with you, or reflect your them, create you own Soul Questions. How do I define balance?  How do I know when I’m in balance . . . or out of balance?And how do these states manifest it in my life?  Is balance a short-term effect or a long-term dance? What aspect(s) of my life do I prioritize? What aspect of my life do I ignore, put on the back burner? How do I recognize when I take on too much?  What can I do in this lunar journey to maintain or restore balance in my life?